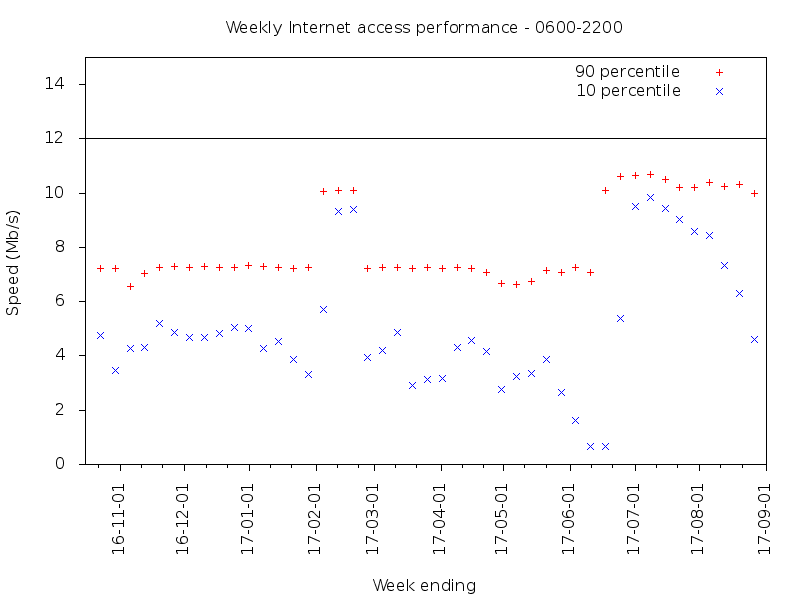 Review of 10 months of iiNet broadband Internet access detailed a fairly disappointing performance record of our first NBN based service, a 12/1Mb/s FTTN service from iiNet. 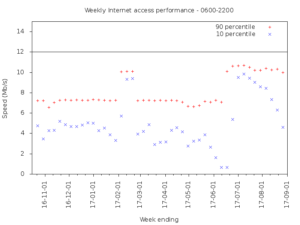 With a perception that online performance had degraded and was unsatisfactory, the results of an automated half hourly file download were consulted to verify those perceptions. 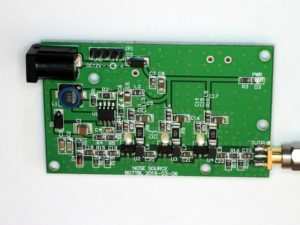 The generic heating / cooling controller (hcctl) is a flexible bang-bang controller based on an ATTiny25. The controller will accept 4-20mA input if the input is shunted by a 50Ω 1% resistor (2 x 50Ω 1% resistors is a practical implementation) and the 4-20mA sensor is wired between nominal +24 and the input pin. 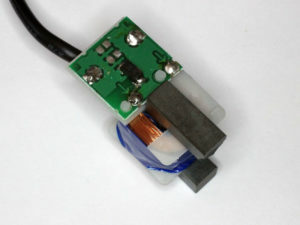 Note that 4-20mA sensors may operate properly on less than 24V (the one used here is a DIN rail mount that works for 10-24V). To demonstrate the capability, a Pt100 RTD is connected to a 4-20mA converter and then to a hcctl test module (see above). 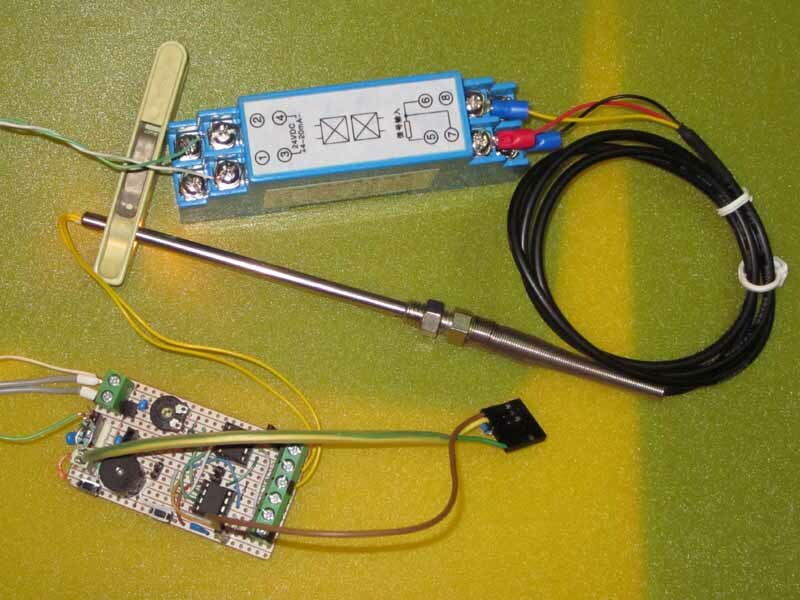 The test module is driving a small incandescent lamp which is clipped to the RTD to provide a cycling test. ESP8266 remote power display for energy monitor – EV3 documented an evolved design for a real power display using emontx3 / emonhub / mqtt. 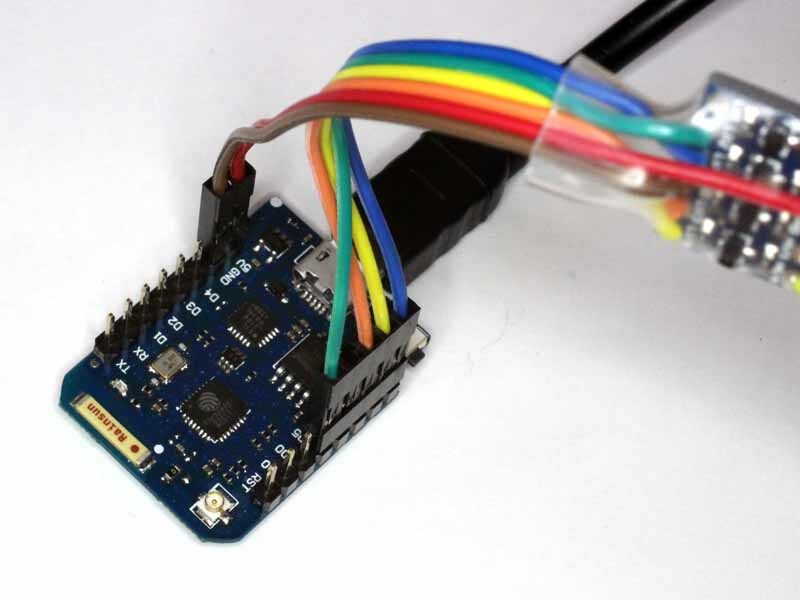 This article documents an adaptation to use a 5V display module (for higher brightness). The ESP8266 is not 5V tolerant, so a logic level converter is needed. 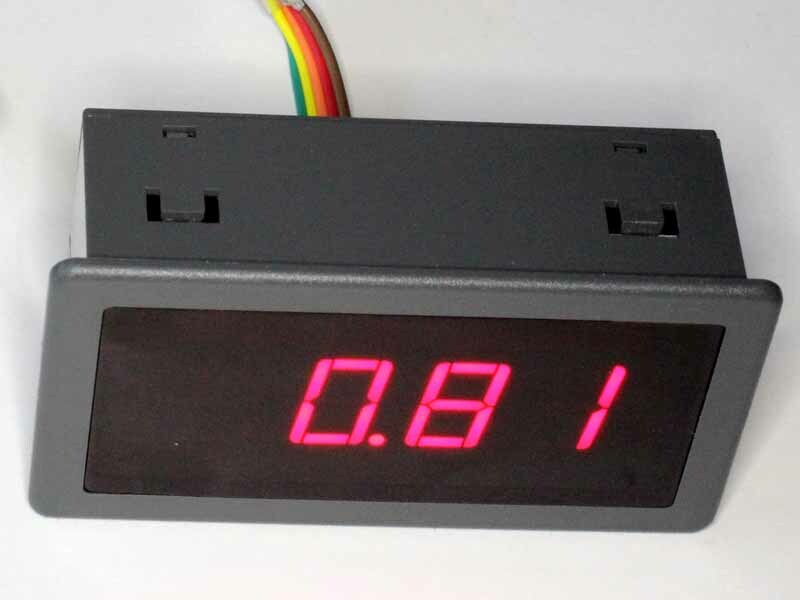 The remote power display uses a Wemos D1Pro module, a common 5V 4 digit 14.2mm seven segment LED module with 74HC595 shift register per digit, and a common 3V/5V logic level converter between them. ESP8266 remote power display for energy monitor and ESP8266 remote power display for energy monitor – EV2 documented a design and some variations for a real power display using emontx3 / emonhub / mqtt. 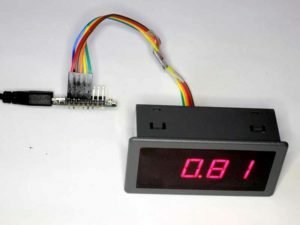 This article documents an evolution to use the ESP8266 HSPI port for much higher speed writing of the LED display, high enough to be later adapted for multiplexed displays. The remote power display uses a ESP8266-12E devkit 1.0 module, a common 3.3V 4 digit 14.2mm seven segment LED module with 74HC595 shift register per digit. 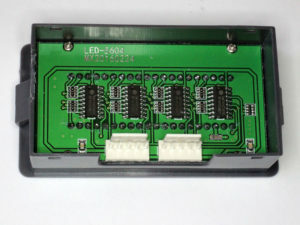 The particular LED module has sufficient space to mount the ESP8266 inside the module. 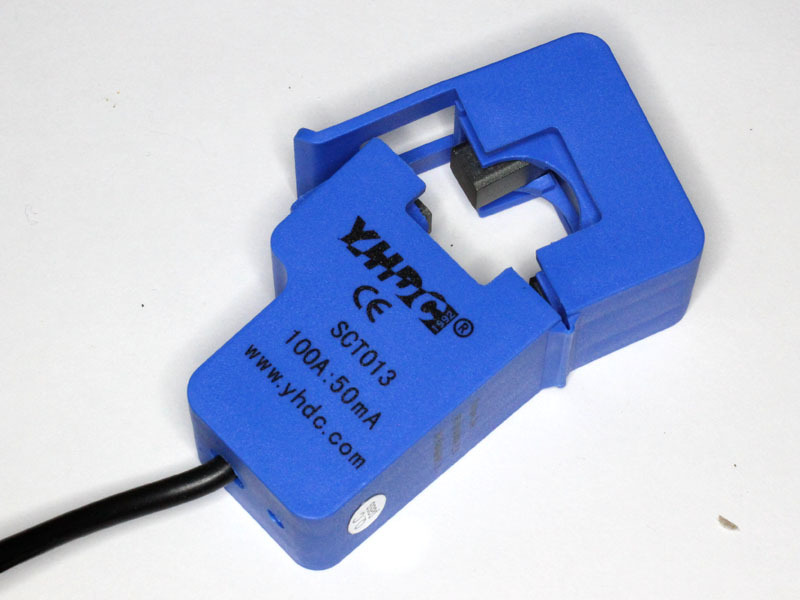 The YHDC SCT013 series is very popular for use in energy monitor projects. Warning, the core is VERY hard, but VERY brittle, don’t hit it with anything hard, don’t grip in with pliers, don’t drop it on a hard surface. The coil and half core are held in the lower housing by two obvious catches which click over the bobbin. Removal means pulling the assembly upwards gently whilst releasing the catches and feeding cable into the housing. One of the catches will probably catch on the slot in the bobbin, be prepared to release it. An ideal tool for the purpose is an ordinary $2 DIP chip puller which can be used to get purchase on the two ears on the bobbin that can be seen in this pic. Push a little cable into the housing, pull upwards while releasing the catches, then feed more cable and the assembly is pulled upwards from the housing. Above is the PCB detail. This one has a TVS (the black component) and no burden resistors. There is a place for two parallel 0806 burden resistors on the board. 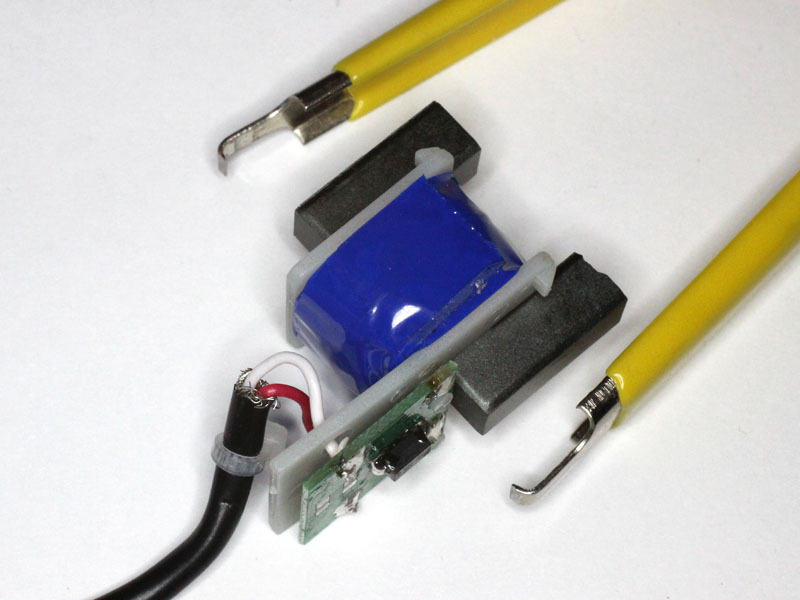 The PCB floats on two plastic pin extensions of the bobbin. You may obtain benefit in securing it with two very small fillets of hot melt adhesive as above, small enough so as to not interfere with the guide rails in the enclosure. 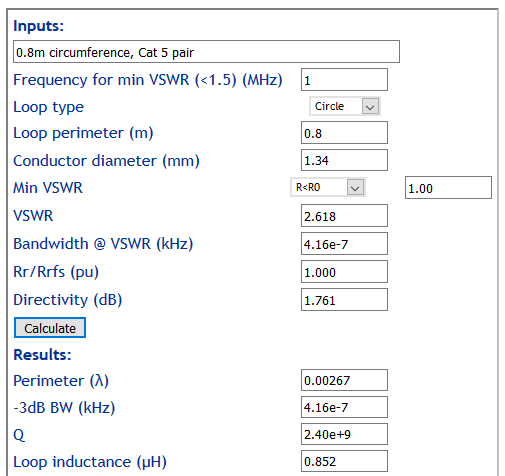 So if you wanted to add a burden resistor for 0.333V out at 50mA secondary current, R=0.3333/0.05=6.6667. You could do this with 1% resistors in the E12 value series, 12Ω and 15Ω will give the desired resistance. 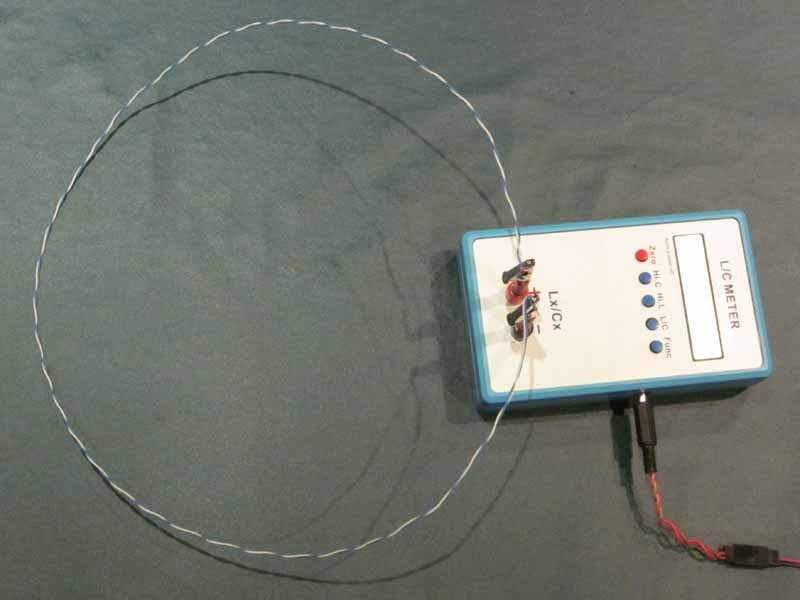 Likewise for 1V out, 22Ω and 220Ω in parallel will give the desired value of 20Ω. 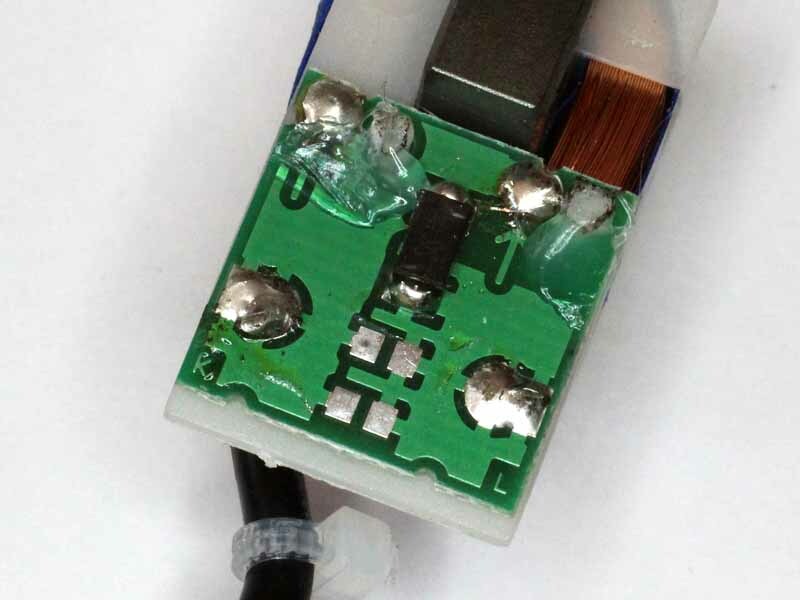 If you wish to remove existing burden resistors, they can be removed with specialised tooling but small SMD resistors will usually melt the other side solder moments after melting the first side. Position a toothpick with one had to push the resistor sideways, with the other and use the soldering iron to eat one side to melt, move the soldering iron to the other side and push the resistor sideways with the toothpick as soon as both sides melt. A CT that has no load could develop extreme and damaging voltage within the secondary winding in the presence of primary current. If the CT assembly does not have an integral burden resistor, it is wise to install a TVS or pair of inverse series 9V Zener diodes to prevent excessive voltage lest the external load be disconnected. This is a review of the BG7TBL noise source available on eBay for about $20 incl post. I have seen this recommended in various online forums and thought it worthy of review. Above is the device. The layout is pretty simple, it is a Zener noise source at the left followed by three MMIC amplifier stages. The circuitry at mid left is a DC-DC converter to supply 25V to the Zener. three stages of MMIC will give rise to huge output, notwithstanding the on-board attenuators at Zener output and final MMIC output. ESP8266 remote power display for energy monitor documented a design and some variations for a real power display display using emontx3 / emonhub / mqtt. This article documents a simple compact implementation. This article documents remote power display for an energy monitor system based on emontx3 / emonhub / mqtt. 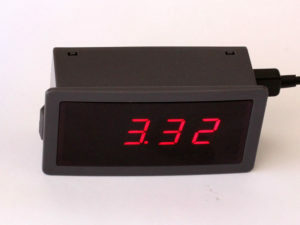 The remote power display connects via WiFi and subscribes to a topic on a MQTT server, updates are published every 10s with data from the emontx3 by emonhub. I tried to make an antenna loop for longwave with cat 5 and after it did no good I realized the twisted wires canceled each other out. Or did they really cancel? I constructed a loop of one Cat 5 pair and measured its inductance when both wires are bonded at the ends. The conductors are 0.5mm diameter and spaced 0.9mm. To estimate the inductance we use the geometric mean radius (GMR) as the equivalent radius of the pair. GMR=(0.5*0.9)^0.5=0.67, diameter=1.34mm. 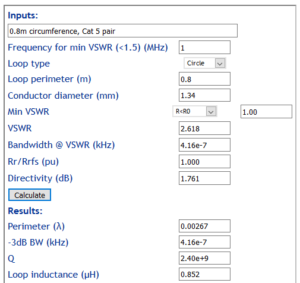 So let’s calculate the inductance of a single turn circular loop of 0.8m perimeter and round conductor of 1.34mm diameter. The estimate above is 850nH.